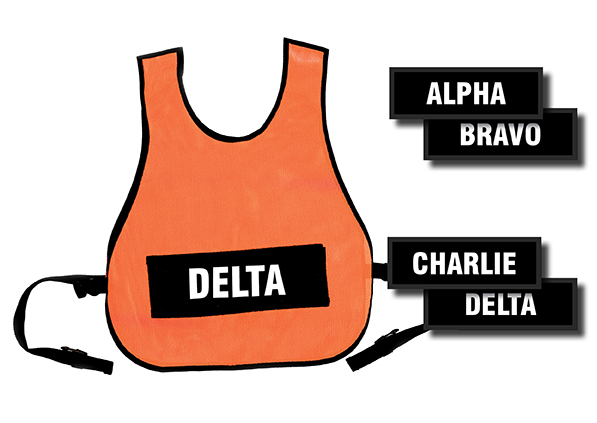 The “ABCD” Vest (#001OR-ABCD) is designed so that a single ID vest can be quickly configured to identify the captain, division supervisor, or other officer assigned to the ALPHA, BRAVO, CHARLIE, or DELTA side of a building. One pair of reversible title panels are imprinted with ALPHA and BRAVO on opposite sides, and a second pair of panels are imprinted with CHARLIE and DELTA on opposite sides. The panels feature loop VELCRO® Brand strips on the perimeter of each panel which adhere to a hook VELCRO® Brand patch on the vest to identify which side of the building the Division Supervisor is assigned to. The unused pair of title panels store inside the vest with VELCRO® Brand adhesion when not in use. The nylon mesh vest is available in a variety of colors.